This weekend, the Diocesan Administrator of the Diocese of Clogher, Monsignor Joseph McGuinness announces the annual diocesan changes for 2018. The changes are accompanied by a Pastoral Letter, entitled The Future Mission of Our Parishes, in which he outlines both the background to the changes and some of the steps that will be need to be taken immediately in all parishes so that they can continue to realise their mission. The changes see the retirement of four Parish Priests and the appointment of several existing and new Parish Priests to take charge of more than one parish. Above all, the changes herald a new departure in how pastoral ministry will be carried out in the diocese. From now on, the availability of priests and the consequent provision of Masses will not simply be on an individual parish basis but will depend upon neighbouring parishes working together in the 7 Pastoral Areas of the Diocese. As Mgr McGuinness points out, this builds on the decisions made by Bishop Liam MacDaid in 2013 when he first created Pastoral Areas in the Diocese to encourage co-operation and collaboration between priests and people in neighbouring parishes. This collaboration will be put on a more practical footing, which will develop and flourish as time goes on. Over the coming weeks, the priests in each Pastoral Area will meet with Mgr McGuinness to arrange weekend and weekday Masses and other liturgies in a way that provides a range of Mass times for parishioners across neighbouring parishes and enhances the community dimension of the liturgy and provide the basis for much more significant and visible lay involvement in parishes, such as lay people leading some liturgies. Another aim of these new arrangements is to reduce the workload of priests and to make provision for holiday cover and the possibility of illness. In addition, administration of parishes will, progressively, be delivered from administration points or offices at key locations around the diocese, so that parishes can share the increasing burden of administration, financial compliance and communications as well as providing people with an efficient and responsive service. In his letter, Mgr McGuinness outlines his vision for a wide range of lay ministries in the diocese. ‘Lay ministry within our church is central to its mission. Fully appreciating and expanding the whole range of ministries across our Diocese involves both great challenge and exciting potential. This is not about making up for the diminishing numbers of priests. It is a response to the baptismal calling of each one of us. It is about encouraging every one of us to reflect upon what we can give in service to our church community’, he said. One key ministry is that of Permanent Deacon. In recent months, the Diocese of Clogher witnessed the ordination of its first such deacon, Deacon Martin Donnelly, Enniskillen. Mgr McGuinness calls on ‘any men in our Diocese who feel called to this ministry to make contact with their local priest to seek more information and explore whether this may be a possible path of service for them.’ He goes on to say that the permanent deacon is only of many ministries; that women and men are needed to serve in all parishes in liturgical ministries, as catechists, lay pastoral workers or in youth ministry, or to share their skills in safeguarding, management, finance, communications, and so on. Above all, Mgr McGuinness calls for more vocations to the priesthood, noting that without priests there cannot be a celebration of Mass. He encourages parents to support a son who shows interest in becoming a priest. His letter puts great emphasis on the joy of priesthood. The letter concludes with a reflection on the mission of the local parish and of the church in general. It draws from the vision set out by Pope Francis early in his pontificate, one which gives preference to ‘the missionary option’. Mgr McGuinness calls on parishes, working together, to re-discover that missionary option. Noting that many will see the scenario facing the diocese as challenging, he outlines how the diocese overcame similar crises in the past, by discerning the signs of the times, adding that the diocese and each parish is called to do the same again today. Therefore, he concludes, the changes should be looked on not in terms of self-preservation but in terms of the great possibilities that lie ahead for the People of God. The following are the Diocesan Changes, effective Saturday 8 September 2018. Very Rev Canon Joseph Mullin, PP Lisnaskea & Maguiresbridge (Aghalurcher), to retire and be PE, Maguiresbridge. Very Rev Canon Michael McGourty, PP Irvinestown (Devenish), to retire and be PE, resident in Ballyshannon (St Joseph’s) and supporting pastoral ministry in the parishes of Bundoran-Ballyshannon and Belleek-Garrison (Magh Ene and Inis Muighe Samh). Very Rev Michael King, PP Newtownbutler (Galloon), to retire and be PE Newtownbutler. Very Rev Jimmy McPhillips, PP Derrygonnelly (Botha), to be PP Lisnaskea & Maguiresbridge (Aghalurcher) and Adm. Newtownbutler (Galloon). Rev Cathal Deery, CC Clones, to be PP Derrygonnelly (Botha). Very Rev Canon Pat McHugh PP, Castleblayney (Muckno), to retire from administration and to take sabbatical leave. Very Rev Canon Shane McCaughey, Priest in Residence in Aughnamullen East, to be PP Castleblayney (Muckno) and Adm. Aughnamullen East. Very Rev Tom Quigley, PP Latton (Aughnamullen West), to be PE Latton. Very Rev Owen J McEneaney, PP Ballybay (Tullycorbet), to be also Adm. Latton (Aughnamullen West) and Rockcorry (Ematris). Rt Rev Mgr Joseph McGuinness, Adm. Tyholland, to support Pastoral Ministry in the Parish of Monaghan and Rackwallace. Rev Owen Gorman, CC Castleblayney (Muckno), to be Priest in Residence Aughnamullen East, supporting Pastoral Ministry in the Mid-Monaghan Area. Rev Leo Creelman, CC Castleblayney (Muckno), to be CC Monaghan and Rackwallace. Rev Stephen Duffy, CC Monaghan and Rackwallace, to be CC Castleblayney (Muckno). Rev Kevin Malcolmson, CC Monaghan, and Rackwallace to be CC Enniskillen and Lisbellaw. Rev Michael Jordan, CC Carrickmacross, to be Priest in Residence Killanny, supporting Pastoral Ministry in the South Monaghan Area. Rev Seán Mulligan, newly-ordained, to be Priest in Residence Carrickmacross, supporting Pastoral Ministry in the South Monaghan Area. Rev Kevin Connolly, Deacon, to minister in the Parish of Monaghan and Rackwallace. Rev Martin Donnelly, Permanent Deacon, to minister in the Parish of Enniskillen and Lisbellaw, supporting Pastoral Ministry in the Enniskillen and West Fermanagh area. The following is the text of the Pastoral Letter from Monsignor Joseph McGuinness, Diocesan Administrator. This weekend, I am announcing this year’s diocesan or priests’ changes for the Diocese of Clogher. Given that we are still awaiting the appointment of a new bishop in the Diocese, I had hoped that any significant changes could be postponed until that appointment was made. However circumstances are such in the Diocese that changes are now needed to address the immediate challenges that we face. In this letter I want to set out very clearly the context in which the changes are being made and to highlight the serious and challenging situation facing us as a diocese. At the same time, I want to make you all aware of the great possibilities that lie ahead: that the call to ministry in our parishes and pastoral areas is open to all men and women and that the time has now come for a new approach to how parishes celebrate and operate. Before doing that, I want to thank each and every one of the priests of the diocese for their faithful service in ministry, for their dedication to the people in their parishes and for their generous commitment to the work of the Diocese as a whole. Those who have agreed to make the moves announced this weekend deserve my own personal thanks for their willingness to co-operate with me for the greater good of the diocese. I pay particular tribute to those priests who are retiring this year. The parishes they have ministered in, and the people whose lives they have touched, have been especially blessed. The willingness of these priests, and others who have passed the age of retirement, to continue to offer pastoral care to the people of our Diocese is very deeply appreciated. I mentioned the challenges we face, and I would like to explain exactly what this means. Today, the 37 parishes and 85 churches in our diocese are served by just 58 priests in active ministry. This represents a reduction of about a third in the number of active priests in the diocese in just twenty years. During the past year alone we have lost the service of 7 priests through death, serious illness and other reasons. Although we are very grateful to have had one new priest ordained, it is clear that the number of active priests in our Diocese will continue to decline. This is only part of the picture. If we examine the age profile of the 58 priests who are active in our parishes we find that 28 of these (almost 50%) are over the age of 65. Of these, 14 have retired from administration as Parish Priests, with more due to retire in the coming years. Only 7 of our priests are under the age of 50. There are obvious implications in this for our ability to sustain the levels of pastoral and sacramental provision which have existed until now, as well as the administrative structures within our Diocese. The changes which I am making are the beginning of a process to deal with the reality of the present and the challenge of the future. Firstly, I want to build on the decisions made by Bishop MacDaid in 2013 when he first created Pastoral Areas in the Diocese to encourage co-operation and collaboration between priests and people in neighbouring parishes. This collaboration will be put on a more practical footing, which will, I hope, develop and flourish as time goes on. From now on, the availability of priests and the consequent provision of Masses will not simply be on an individual parish basis but will depend upon neighbouring parishes working together in the 7 Pastoral Areas of the Diocese. Secondly, it will be unavoidable that not every parish will have a resident Parish Priest. The administration of some parishes will be overseen by a neighbouring Parish Priest. However all parishes will have a priest residing in the parish. Some of these priests will have responsibility for ministry in a group of parishes. Thirdly, the number of Masses in all parishes will need to be reduced to take account of the new reality. (b) reduce the workload and stress on priests and also allow for holiday cover and the possibility of illness. (e) begin the process of establishing administration points or offices at key locations around the diocese, so that parishes can share the increasing burden of administration, financial compliance and communications as well as providing people with an efficient and responsive service. I will be leading each of these meetings and we will work together to ensure that the decisions made are balanced and take account of local circumstances as much as possible. Change is difficult for all of us, and I know that some priests and laypeople may find it hard at first to accept and to adjust to the changes over the coming weeks and months. Ministering in a small rural parish myself, I know and value the affinity and the loyalty which people have to their own community and their own parish and the status that the parish has traditionally enjoyed in Irish society. There is no intention to diminish any of this. There is no intention either to dissolve or amalgamate any parishes. What is needed, however, is the vision and generosity of spirit which encompasses the bigger picture and embraces a collaborative and outgoing sense of Christian mission. As well as challenges, I have also mentioned possibilities. A key element in the life of the church in our parishes is the ministry of laypeople. Without the generous and loyal help of many lay volunteers, our liturgical and faith life would be greatly impoverished, and the day to day running of our parishes and Diocese would be impossible. I thank each and every one of you for the way in which you continue to share your gifts to support and enhance the life of your parish. Lay ministry within our church is central to its mission. Fully appreciating and expanding the whole range of ministries across our Diocese involves both great challenge and exciting potential. This is not about making up for the diminishing numbers of priests. It is a response to the baptismal calling of each one of us. It is about encouraging every one of us to reflect upon what we can give in service to our church community. It is about allowing the gifts of each one of us to find a rightful and fruitful place in the service of God and our neighbour. It is my hope that the range of ministries in our Diocese will expand substantially in the future. Already we have seen the first Permanent Deacon ordained for the Diocese. I encourage any men in our Diocese who feel called to this ministry to make contact with their local priest to seek more information and explore whether this may be a possible path of service for them. But this is only one form of ministry among many, and all have their unique value. There may be more men and women who can contribute to the life of our parishes and Diocese in liturgical ministries, as catechists, lay pastoral workers or in youth ministry, or who have skills in safeguarding, management, finance, communications, and so on. The range and quality of the gifts and talents of the people in our parishes, and the generosity shown already by so many, should be a cause of great encouragement and hope for all of us. While we acknowledge the great gift of lay ministry in our Diocese, let us continue to pray for and encourage vocations to the priesthood. We need priests because Catholic communities across our diocese need to be nourished by the Eucharist. Without priests we cannot celebrate the Mass. We need priests, because the life of a priest is a positive sign of God’s presence in the world and in the community. Today’s world often tries to tell us that the life of a priest is a lonely life. His role is often painted in negative terms. Let me assure you that the priest’s life is not lonely. It is joy-filled. Yes, like every life, it has its moments. But the beauty of encountering the Lord in prayer and in the Mass and Sacraments, the joy of bringing pastoral care and accompaniment to all of God’s people, the friendship of many men and women, young and old, the support of other clergy and the satisfaction of being of service to people and to God, is simply marvellous. Parents, if your son is considering the call to priesthood, please do not dissuade him. Instead, accompany him. It is the Lord who is calling. Also, I urge any man who is thinking about God’s call to him, to please come forward and enter the door that God is opening for you. Friends, your kindness, support and understanding to your priests is immeasurable. Please continue to pray for us and to help us, and if there is a new priest coming to your parish, know that he comes with an open heart, and give him a warm welcome. The picture presented in this letter may be challenging. But those who have gone before us faced similar or even more daunting situations. 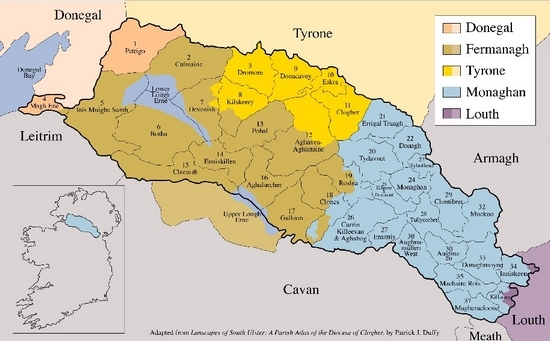 Just two hundred years ago, in 1817, the Diocese of Clogher had a population of approximately 300,000 – three times what it is today, and it was served by just 50 priests. Of course it was a different time and a different place, but the faith of the people survived and grew because the Church, guided by the Holy Spirit, discerned the signs of the time. We are called to do the same today. That is the opportunity for us in our time. The changes announced this weekend are not designed for self-preservation. Nor should our reaction to them be born out of a desire for our own vision of self-preservation. They are designed for the future mission of the Church here in Clogher, and our response to them, priests and laity alike, must be in that spirit. If we are prepared to work together as local parishes and local clergy, then we will, with the guidance of the Holy Spirit, and the intercession of Mary our Mother, succeed in our mission. Knowing that Christ the Lord walks with us, may we look to the future with joy and great hope.